Super Savings Item! Free Shipping Included! Save 38% on the Lodge L8DD3 Cast Iron Dutch Oven 5 qt by Lodge at Baking Love. MPN: L8DD3. Hurry! Limited time offer. Offer valid only while supplies last. 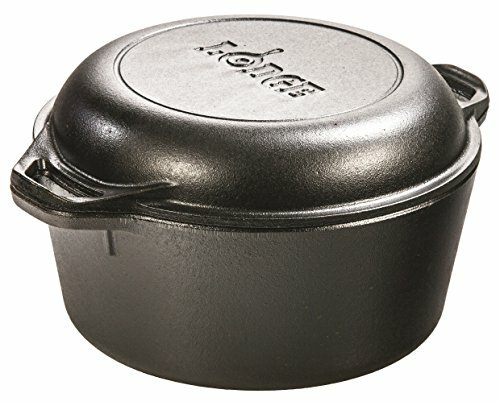 The Lodge L8DD3 Cast Iron Double Dutch Oven, 5-Quart is sturdy, integral, and features ovenproof loop handles for lifting and handling convenience. The Lodge L8DD3 Cast Iron Double Dutch Oven, 5-Quart is sturdy, integral, and features ovenproof loop handles for lifting and handling convenience. Tightly controlled metal chemistry and exacting mold tolerances deliver consistent product for even heating and superior cooking performance. The High Dome lid offers greater capacity and also works double duty as a skillet. Electro statically coated with a proprietary vegetable oil, and cured at high temperatures to allow the oil to deeply penetrate the surface of the cast iron. Measures 12.62" x 10.38" x 6.3" with lid. The item is sealed with a pre-seasoning oil which leads to a drop that can appear like rust which will burn off with 1-2 cookings. 5 Quart Seasoned Cast Iron Double Dutch Oven. The Lodge Cast Iron Double Dutch Oven works overtime. Featuring a lid that easily converts to a skillet. The domed cover is great for roasts and non-knead bread recipes, too. Conducts heat evenly and efficiently - just like cast iron should. Measures 12.62" x 10.38" x 6.3" with lid.